On Febraury 25, 2002 the CUNY Board of Trustees mandated that a technology fee of $75 per semester for full-time students and $37.50 per semester for part-time students be charged to all CUNY students effective in Fall 2002. In 2008, the Student Tech Fee was raised to $100 for full time students and $50 for part-timers. Revenue from this fee is retained by the colleges to improve computer services for their students and faculty. New revenue was estimated at $22.5 million in 2002; with the increases in the charge and enrollment since then, it is even greater now. Want to know more? Further description of STF at the Graduate Center can be found here. But does STF work for you? When it was raised in 2008, the DSC noted some important issues in the Advocate, including a lack of trans­parency in how STF monies are spent, as well as the limited means for stu­dents to par­tic­i­pate in this deci­sionmak­ing process. Efforts to address these limitations have been organized by the DSC, including the creation of a Steering Committee Officer dedicated to student tech issues and the designing of an annual survey tool to assess existing technology needs and priorities concerning information technology resources (results of the Student Technology 2010-2011 survey can be found here). In 2012, the STF Committee worked hard on implementing the ideas that students shared in the 2010-2011 and 2011-2012 Student Technology Survey. 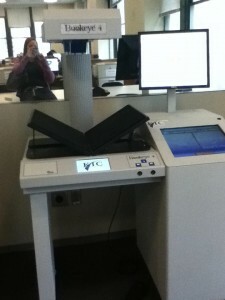 We made progress on scanning capabilities with the arrival of the new KIC Bookeye Scanner, located in the southeast (East 34th Street and 5th Avenue) corner of the library. In addition, the library systems staff implemented a proposal to repurpose unused copiers into scanners. The DSC Steering Officer for Technology and Library has addressed issues of information dissemination through the creation of this site, as well as through increased communications to DSC representatives at Plenary meetings and through announcements and updates sent by the DSC Co-Chair for Communications. The Technology and Library Officer is also working on a list of current GC software that includes product descriptions to help students understand which resources are available to them. Starting in the 2013-14 academic year, a portion of the STF was set aside to fund student instructors to run software training workshops. Grants are awarded throughout the year on a rolling basis. Details about these Student Tech Fee Workshop Grants are available on the DSC website. With significant enrollment increase since 2002, STF funds stand at $925,000 for 2014-15. The 2014-15 DSC Officer for Technology and Library and student members of the Student Technology Fee Committee represented student interests in the allocation of these funds. They contributed to the STF Committee plan for the next academic year, 2015-16. The current plan is available on the GC IT website here. We continue to encourage suggestions and proposals from students on how to improve the Mina Rees Library and our technology resources! The 2014-15 STF Committee voted unanimously to approve the 2015-16 STF plan, and it can be found here.